Happy New Year! I hope everyone had an amazing holidays. Now that we start Protected content will continue on our journey to new countries and its wonderful films. I'm looking forward to hosting you all this month of January for a film which showcases the country of Mexico. A co-production of Mexico and the United States, it stars Yalitza Aparicio and Marina de Tavira. 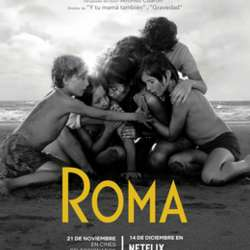 Set in Protected content 1971, the film is a semi-autobiographical take on Cuarón's upbringing in Mexico City, and follows the life of a live-in housekeeper to a middle-class family. The title refers to Colonia Roma, a neighborhood in the city. 18:30 to 19: Protected content arrives. We'll be pouring glasses of wine, beer, or cocktails and getting to know each other. 20: Protected content Starts *Do note, as often we engage in great conversation, the start time varies a bit. If you have an issue or concern with a tight agenda, just let us know. 22: Protected content - We'll discuss the film and eat desserts. To participate, please be willing to contribute TWO of the following (any combination): You will notice we pick items from the country where the film takes place. - a Mexican inspired hors d'oeuvres/appetizer, or main dish to share before the film, when we'll spend some time getting to know each other. - a Mexican dessert to share during our discussion after the film. - a bottle (or two, if you are unable to bring an appetizer or dessert) of wine, beer, or cocktail inspired by Mexico to share throughout. As we get closer to the event, everyone coming should post what they're planning to bring on the message board. This helps all of us to see what else we need, and avoid duplicates.